I tried to fit this all in a paragraph for my highlights of the week. I couldn’t do it. The pain of watching good cartoons is real, guys. I’ll try and keep it as short as I can. 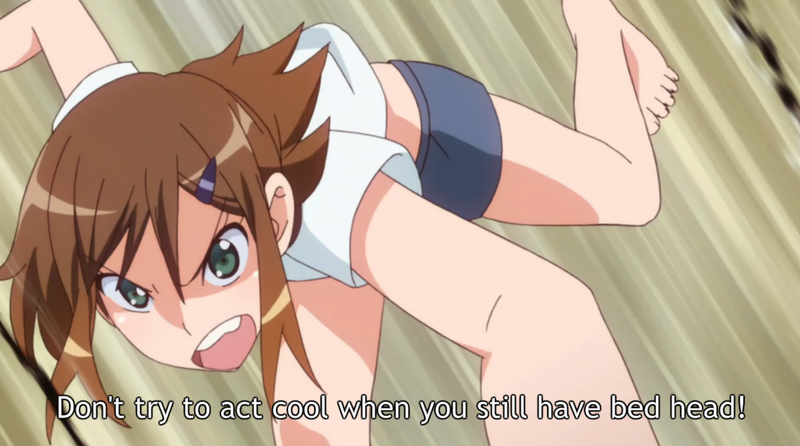 You have to give Trigger some credit: they may not have the budget to make this show super pretty or cool to watch all the time, but they picked an adaptation that has some real gems hidden inside. 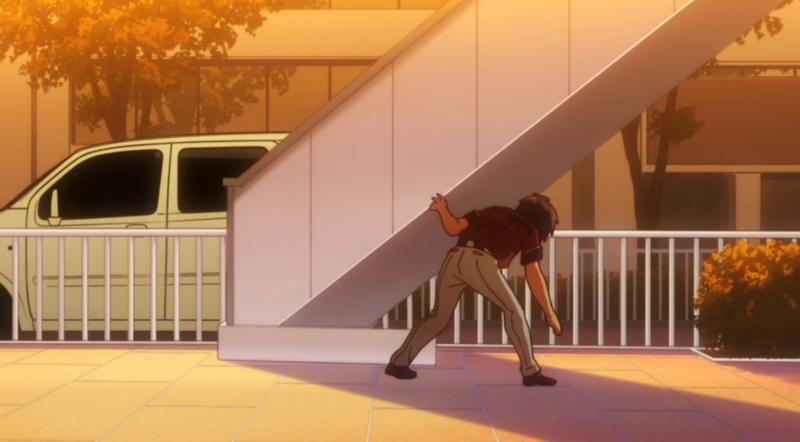 Truly, Inou Battle has a surprisingly good grip on the realism of human relationships and conversations. It shows up all the time in little lines that capture true moments, but is featured best in Andou’s relationship with Tomoyo to this point and, now, with Hatoko. I mean, seriously, guys! This is a freaking light novel adaptation that acts like it actually understands how human beings interact and exist in relationship to each other. Andou, despite being a chunnibyou, has a beautiful sensitivity to the feelings of others and just enough forwardness to not beat around the push like a normal harem protagonist would. That’s not to say he’s tactless or perfect, but that he has a human balance of understanding and obliviousness. 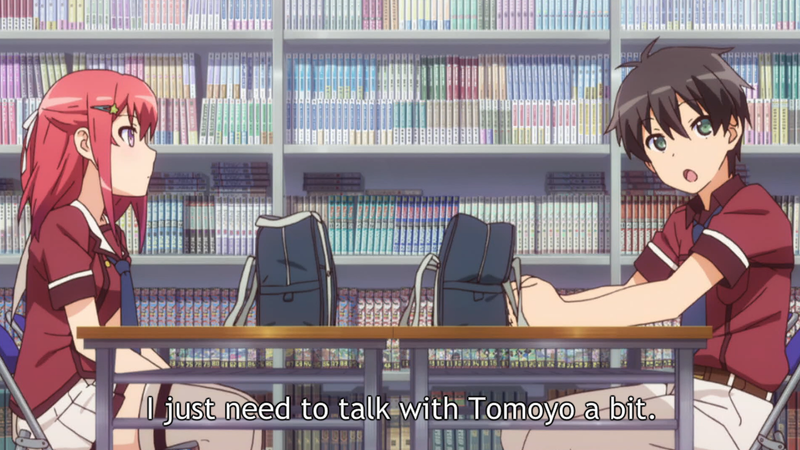 This crops up first in Andou noticing and wanting to talk to Tomoyo about her participation in the literature club’s activity for the day. He takes the information he knows about her already, and asks to talk to her. Now, the way he perfectly analyzes her reservations about writing with the club struck me as a little too convenient, but it’s not inconceivable that he would come to the conclusion he did. The more important thing is that he remembered. In trainings that teach people how to be good listeners, one of the things they often tell you is to remember things about the other person and bring them up later. It shows that you’ve really, actually invested in that person. I don’t think its a coincidence that Andou lapses into his chunni voice as he compliments Tomoyo after her admirable determination not to use her lack of “talent” (I think skill might be a better translation for the situation)—despite his directness sometimes, he still is using the chunni persona to hide somethings, and it seems confessing the significance of the impression Tomoyo is making on him as she struggles with her dreams is a little too much for him. It’s really smart that this particular hint of hiding things crops up in this episode, because it’s about to break open. 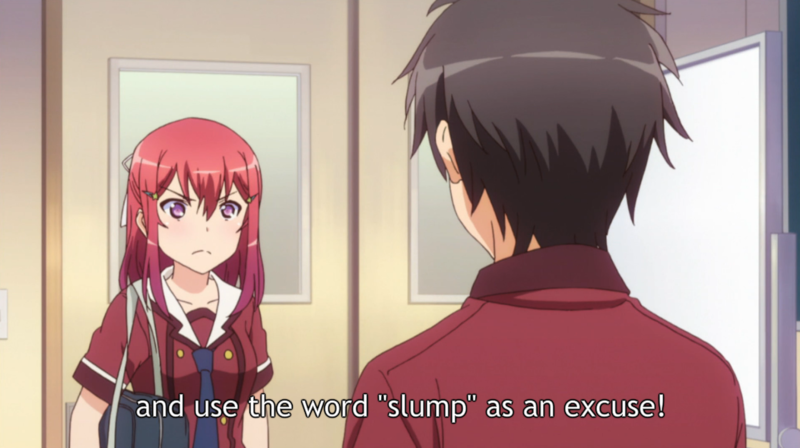 As Inou Battle nails the exchange between one person busy texting (super short answers) and another trying to have an actual conversation (repeated rephrased questions), Andou says the same insensitive thing to Hatoko that he said in the classroom: “You wouldn’t understand.” And she snaps. It’s a chilling, stunning, and sad rant that Hatoko launches into as she deconstructs piece after piece after piece after piece of Andou’s chunni habits and sayings. 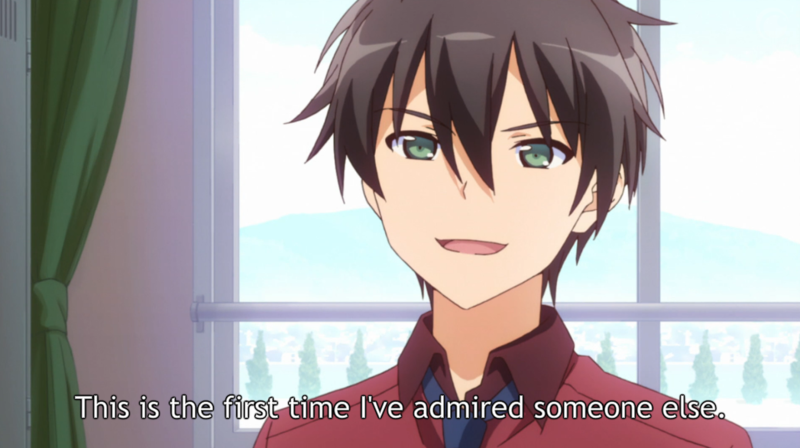 As Andou stands, stunned, Hatoko reveals just how much she remembers of everything he’s told her and just how far away that mass of nonsensical imagination has made her feel from him. You want to know what Inou Battle really thinks about chunnibyou? There’s your answer. It’s a game that distances people from you because they can’t understand what’s going on in your head. It’s layers and layers of pretending that makes people doubt that they really know you at all. Andou’s phone call with Tomoyo is excellent, too—and the fact that she calls him back after he hangs up on her was perfect. Of course she would! That’s the boy she likes calling her about one of her close friend’s locations! And when she shows up, she pushes him enough to reveal his own feelings about his relationship with Hatoko. Turns out, Andou might have been just as hurt by Hatoko’s lack of understanding as she was by not understanding him. Which I totally get! When you like something, or find it cool, or are impacted by something, you want to share it with the people you’re close to. And when they don’t appreciate it the way you do, it hurts. Fortunately, Tomoyo’s there to keep Andou from completely collapsing. She speaks his language, the chunnibyou name that indicates her acceptance of him, and picks him back up. For all this, I don’t really put a whole lot of stock in the eyepatch stranger’s explanation to Hatoko about chunni’s both needing to be understood and not needing to be understood. I think it’s actually about acceptance, which the stranger alludes to, but never really states. And the episode ends with a kidnapping, but really that’s the least interesting bit of everything that happened. Best episode of the season for this show; looking forward to next week. ← Is it Okay to Like Your Lie in April? I agree that this was the best episode so far. Hatoko’s rant was perfect. 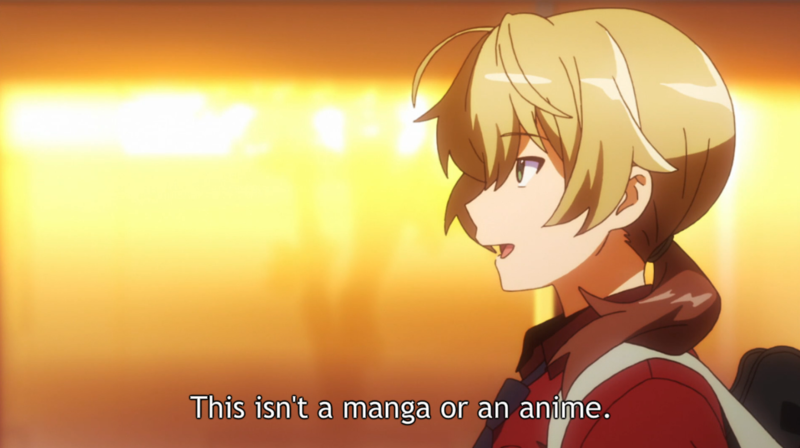 I remember asking myself many of the same questions about various anime over the years, especially the widespread use of English when there exist perfectly fine Japanese words to use! But English is so foreign! So exotic! So sugoi~! And so common, it’s the world’s Global Koine. I noticed VNs having the tendency to use French titles (or sub-titles) in their name though (Grisaia and Ushina are the two VNs airing this season with that feature). I guess it’s one step in the exoticness level from English, and an attempt to make VNs seem more sophisticated than LNs. True, but it does seem so weird to have English randomly interspersed within a Japanese dialog. I mean, it does help when I’m translating manga, but I still can’t shake the oddness of it. I suppose I’d feel the same way if I could read Dostoyevsky in the original Russian and saw all that French written in the Latin alphabet besides Russian written with the Cyrillic alphabet. So, perhaps the Japanese predilection for the English language is not as strange as it looks. Thanks for this post, I hadn’t considered watching this show until now, looks like I have some catching up to do! It’s got some good and some bad to it! I’m generally of the opinion that the pacing is really slow and its not usually that interesting to look at, but it’s got some good qualities to it that you wouldn’t normally expect to see in a light novel adaptation like this. Haha, pretty much every language loves to pepper in foreign words in their phrases to be cool – not just weaboos, but even words like c’est la vie and ergo or schadenfraude is common enough to pop up in normal conversation. 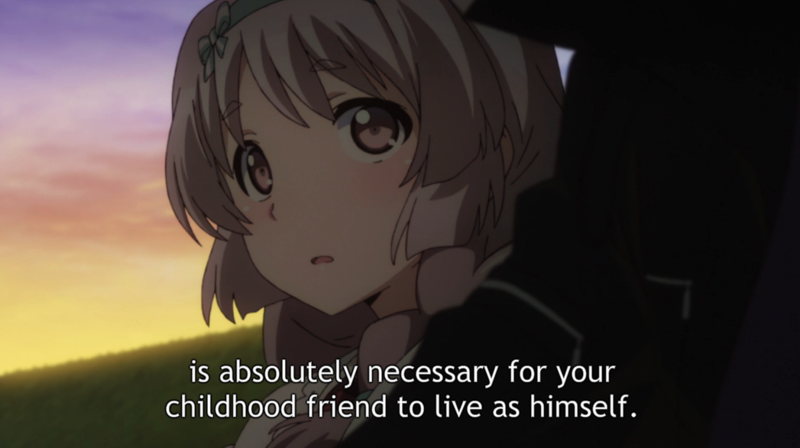 When I first heard of this show, to be honest the only thing I know is that ‘Trigger does LN anime’. I was hoping for some good action sequences from the supernatural battle (it’s pretty much there in the title, after all) but seeing the first ep pretty much dashed that hope. Then I at least hope to get some laughs – and while it’s not painfully unfunny, the humor is nothing spectacular either. The last thing I would expect is some realistic human interactions and relationships, yet that’s the thing I got here. 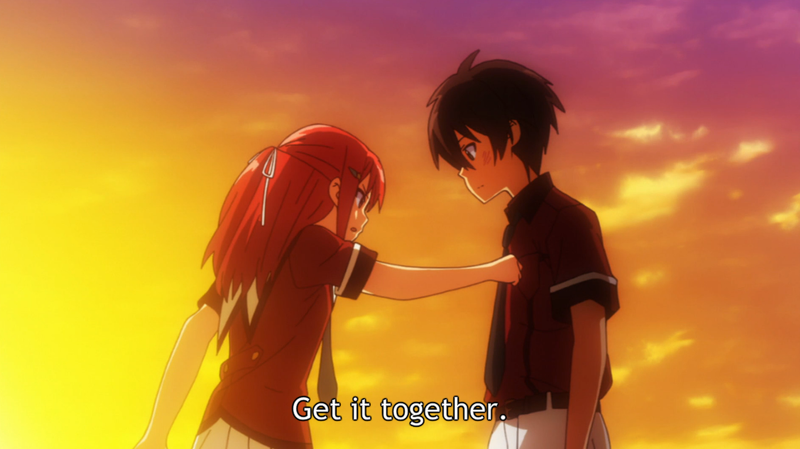 And it’s not just from climactic moment of this episode – like you’ve said, it’s scattered from the very start, with how Andou actually resolves a love misunderstanding as early as the second episode (other series actually use it as their whole plot, let alone resolve it coughNisekoicough) or phrases like “do you want to know?” “do you want to share?”. The best thing I can say about this ep isn’t just that fantastic 2 minute rant by Hatoko (which is about one of the most impactful rant I’ve seen in anime, and Saori Hayami deserves all the praises for it – she barely stops to take a breath, it might as well be done in one take) but how naturally it comes about. 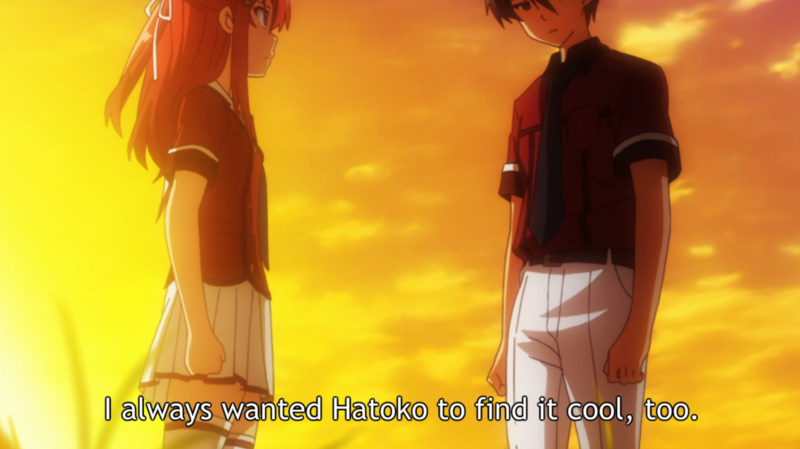 The drama didn’t come out of nowhere – for few episodes we’ve seen Hatoko being concerned and on edge due to Andou’s growing relationship with Tomoyo. And it would make sense that she’s been bottling it up all this time, it’s not forced (narratively speaking) at all. Also, the conflict for the drama didn’t come from Andou being unreasonably stupid, it’s only because he wasn’t attentive to Hatoko’s real feelings (and what teenage boy wouldn’t? Hell, even when you’re an adult you’re hardly any wiser in acknowledging a woman’s feelings, just more experienced). He’s just living his life and passions, and isn’t sensitive enough to see how Hatoko is forcing herself to like it. It’s also nice to see him to have enough friends both to help him reflect on his actions and snap him out of his funk. So yeah, this is definitely the best episode from a surprisingly much better than it initially looks series. 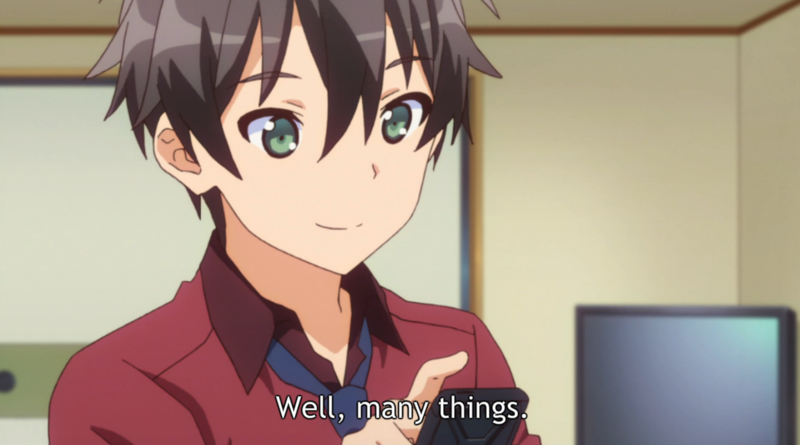 And it looks like we’ll finally have some supernatural battles next ep . It’s interesting how despite the abilities being real, it’s rarely being used as a cause and/or solution for their problems – and even when it is, the main cause it’s always the underlying feelings and not the abilities itself. 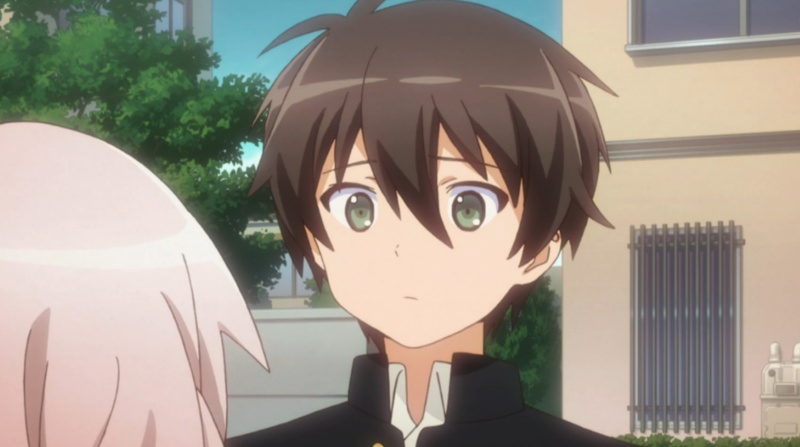 Really, so far we’ve had less time (and definitely less animation) spent on supernatural action sequences compared to Chuunibyou, despite the latter’s fights are just pure imaginations. From what I’ve heard, Saori Hayami did indeed do the rant in a single take. Amazing. And yeah, this is pretty much none of what I expected from this show and lots of other good things: realistic human drama out of a light novel adaptation, a harem at that? Get out of here, is what I would have said. Yet here we are. And yeah, this is sort of on Andou and sort of not. Hatoko seems like she’s been pretty good at hiding her true feelings, too, so it’s not as if she’s been dropping hints and Andou’s been missing them—it’s that she’s been hiding things from him, perhaps even more than he’s hidden from her. 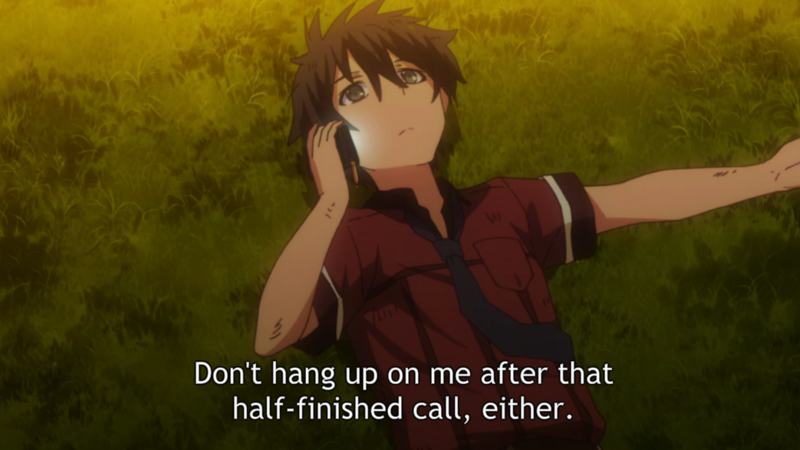 And while Andou could have/should have realized that Hatoko wasn’t keeping up with him, it’s not like it would be totally fair to ask him to just drop the chunnibyou thing entirely. He doesn’t let it completely run his life, as we’ve seen. It’s a situation where both of them and neither of them are at fault. And those are the hardest conflicts to deal with. Yeah, I figured he was, but I was too lazy to go back and check for sure. And you might be right; I may have gone a little too far on my assessment of chunnibyou. After all, it’s part of Andou’s charm that’s drawn people to him—and he spends enough time talking like a normal person that it’s not completely overwhelming his personality. But I don’t know…all the good relationship building that’s happened in the show so far has come divorced from Andou’s chunni behavior. It sort of validates Tomoyo’s own quirks, but for the others…Hatoko has played along (bad), and Sayumi and Chifuyu either ignore or just tolerate it. It could very well just be too early to really say. I get the feeling the show isn’t quite done with its commentary on chunnibyou. I think it’s odd that you describe this show as something that gets relationships when the biggest scene in the show is built on Andou being completely oblivious to his relationship with Hatoko. Not to mention that while Hatoko’s rant was fantastically well done, the scenes leading up to them were forced in to create that drama out of … kind of nothing really. Sure, but Andou was oblivious to Hatoko in a way that I think is totally believable. This is a relationship—it involves two people. 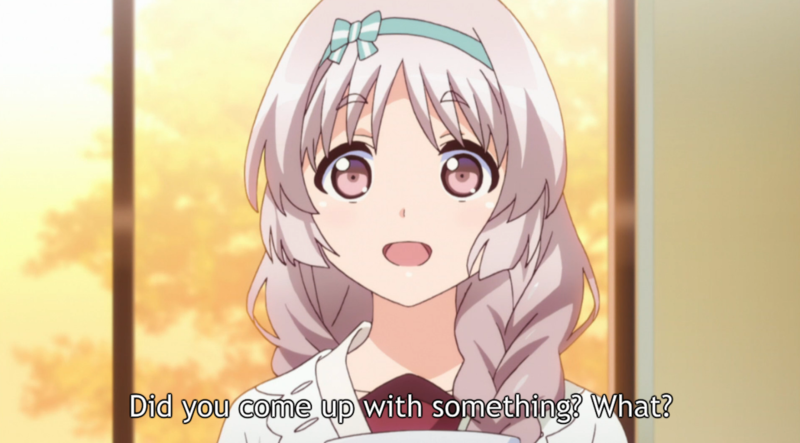 Andou was at fault for constantly sharing things with Hatoko that she didn’t understand, yes. But he did it because he wanted to share something he loved with her. That’s what you do with friends. And it’s not like Hatoko was constantly dropping hints about not understanding—it was a single statement (as we saw in the flashback), and after that she just played along. In other words, I think this is a realistic type of interpersonal conflict. One person creates pain for the other, the other hides it. 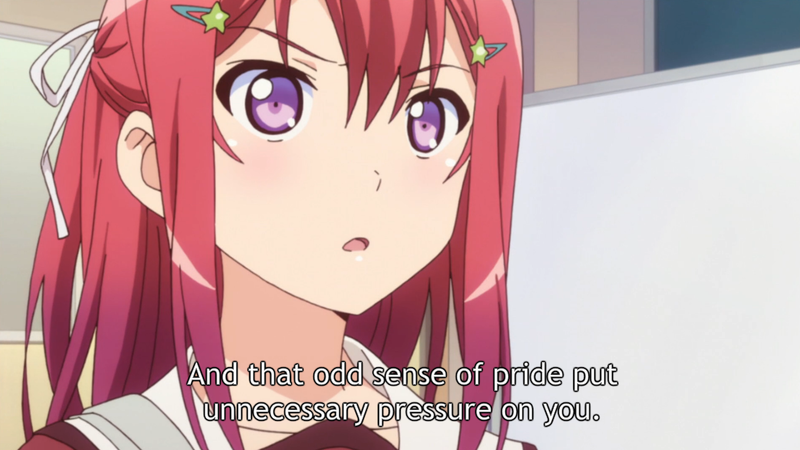 And Hatoko did it perfectly, as Andou’s statements to the guy on the street show. He wasn’t be oblivious as much as Hatoko was hiding things from him. The fault lies with both of them. And I dunno, I thought they lead into the drama pretty well. 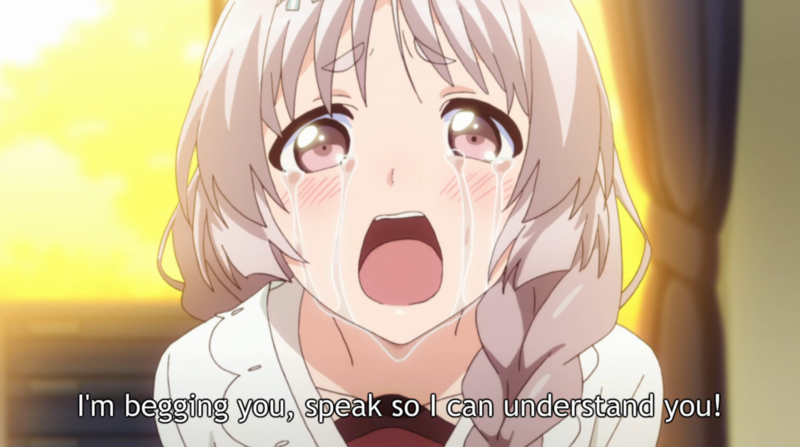 The progression of events that tipped Hatoko over the edge make sense to me: feel estranged, but okay->boy you feel distant from finds connection with another girl->witness them on a date->more pressure->being told “you wouldn’t understand”=but she does->desire for connection, still feeling shut out->breakdown. Huh. Well, there’s a few paragraphs, I guess. tl;dr—people are oblivious in relationships sometimes, and I think it makes sense that Andou could be oblivious to Hatoko’s pain when she’s hiding it like she was. This isn’t harem protagonist level denseness (“Girls are trying to kiss me, what’s this mean? ); it’s just a high school guy having trouble reading past a friend’s long-time mask. 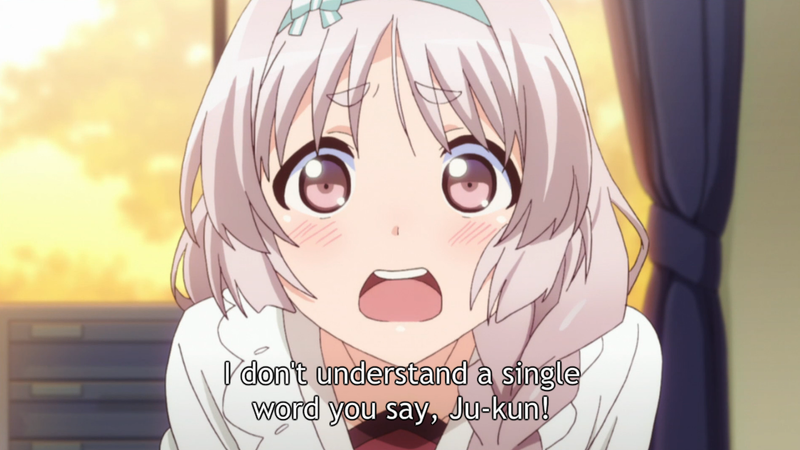 Andou not understanding Hatoko isn’t the same as the show not understanding relationships. That is one of the best scenes from the series. And is fantastic that she tackled one of the most glaring issues with certain chuuni characters, their fascination with evil, sin, the occult, the demonic (speacially Tomoyo’s brother, the guy with the eyepatch). I noticed how he keep saying to her that basically she didn’t understood him anyways, it was condescendent… I was expecting her to snap, but for other reasons, that rant was a surprise.